Wires or cables connected/extending from electronic devices using radio waves (such as cell phones), if not shielded will emit over ambient RF radiation levels. To suppress high frequency RF radiation from interacting with sensitive electronics and biologic systems (cell phone users), we offer a line of clamp-on ferrite suppressors. 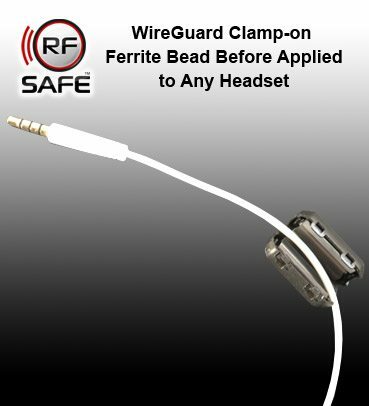 Our ferrite aims to effectively shield the harmful electromagnetic fields from traveling along computers wires, electric wires and cell phone headsets wires that come in contact with your body. WireGuards are the ideal add-on accessory to reduce RF on any headset using a wired design. 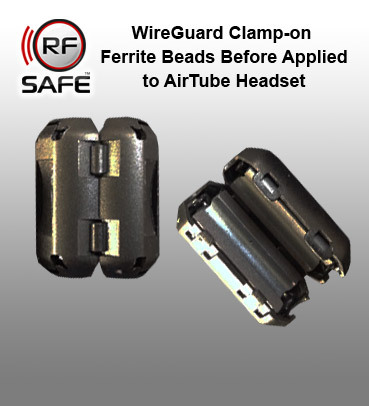 Even Air-tube headsets have a wire “often in contact with your body”, and a WireGuard prevents the wire from acting as an effective high frequency antenna! The WireGuard suppresses radiation transferred up the headset wire to the earpiece without affecting sound quality. Ferrites are used in many consumer electronics to prevent interference from disruptive electromagnetic radiation, but they have limitations. Just as ferrites allow low frequency energy to pass, ferrites have a frequency band they are designed to block. Depending on the ferrites core composition, a ferrite’s performance diminishes at frequencies higher than for what it is rated. While even the newest LTE phones may exceed a ferrite beads limitations, that same exact LTE 4G phone is also designed to operate on network frequencies where the ferrite is effective. RF Safe concludes a ferrite beads usefulness should be likened to an analogy of sunblock. It reduces exposure to a spectrum of radiation, but by no means will it block all the harmful waves/rays. It’s for this reason RF Safe suggest for the most prudent avoidance of RF radiation to use an air-tube headset . That way, there are no wires reaching a users head, and the ferrite is added protection where the wire comes in contact with a users torso. 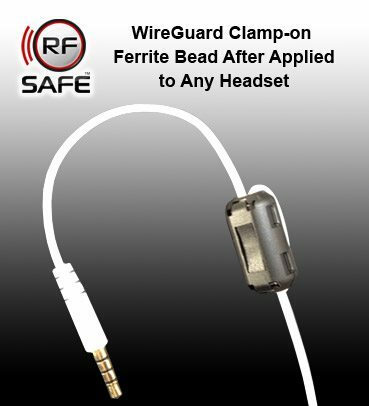 “RF Safe’s ferrite bead is especially important for women that are pregnant or trying to have children when the headset wire is unshielded and comes in contact with the body.” says Coates. The wireguard is a reusable radiation suppression clamp-on device similar to a clamshell. This device clamps over the headset wire above the plug that is inserted into the phone. It incorporates a ferrous composition based material which interacts directly with the high frequency energy and suppresses it effectively while allowing the voice signal to pass through to the earpiece unimpeded. The housing is a black composite manufactured using nylon resins. FITS ANY HEADSET! How it works! The effect of magnetic material on a conductor. Current flowing through a conductor creates a magnetic field around it. Transfer of energy between the current and the magnetic field is effected through the “inductance” of the conductor – for a straight wire the self-inductance is typically 20nH per inch. Placing a magnetically permeable material around the conductor increases the flux density for a given field strength and therefore increases the inductance. 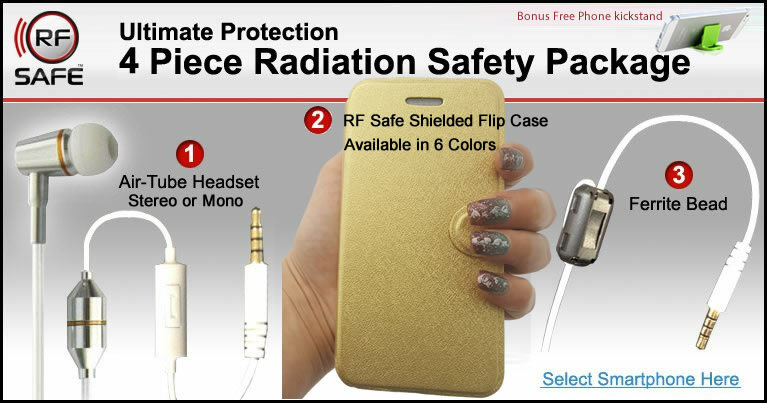 Using a cell phone with a hands free headset that is NOT shielded will dramatically increase rf radiation exposure to DNA within vital organs. All studies have proven in the likely hood that microwave radiation from a cell phone handset is hazardous. WireGuards help prevent the possible 300% increase in RF Exposure to the brain that can happen when not using a shielded headset! 1. Position headset wire just above the plug into either ‘V’ Channel. 2. Close one side over the other, verifying the wire passes through the opening on both sides and the side tabs lock. 3. To transfer to another headset, carefully open the side tabs using a small screwdriver.